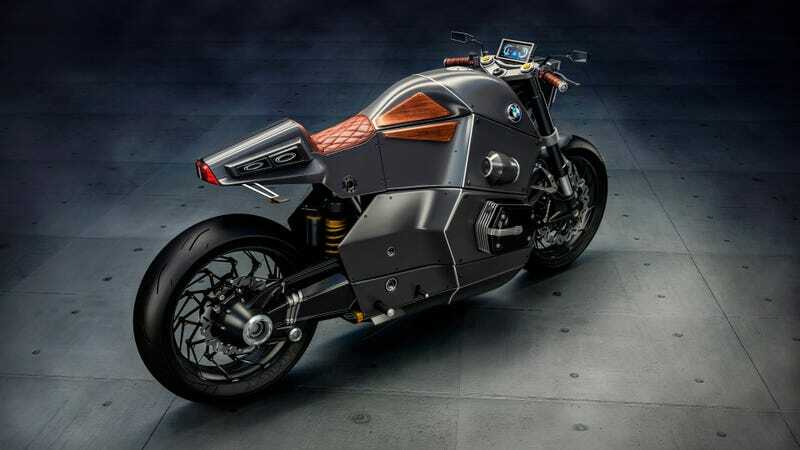 What Kind Of Crazy Motorcycle Does BMW Have In Store For Its 100th Birthday? Photo: Jans Slapins’ BMW Urban Racer design from 2015. BMW is in the middle of a year’s worth of wild concept blitzes to celebrate its 100th anniversary. That meant a futuristic shapeshifting car yesterday, plus the first real concept car from Rolls-Royce and some kind of bizarre Mini I’m way too excited about. But what does BMW have in store for the Motorrad division on its centenary? Sadly, we won’t find out until October in Los Angeles, because that’s where and when the BMW Motorrad Vision Vehicle will be unveiled. And BMW isn’t saying much about the bike (will it even be a bike?) at the moment. In the future, its products will allow riders unimagined freedom. Inventive, intelligent technologies are the key to enjoying every situation in perfect balance while creating maximum safety. Smart gear amplifies the riders’ skills and inspires them to take exciting new journeys, transforming everyday routine into a pure riding experience for all the senses. BMW has already dabbled in the high-tech space with modern bike gear, like the heads-up display helmet concept unveiled earlier this year. With the “smart gear” description, I expect this concept will find some way to further merge rider and machine with technology. Autocar reports the concept’s tagline is “The Great Escape”, and it’s meant to convey the freedom that comes with riding. Whatever it is, I hope it’s completely nuts. Taking the radical ideas shown by the Vision Next 100 concept and applying them to a bike sounds like something to look forward to.